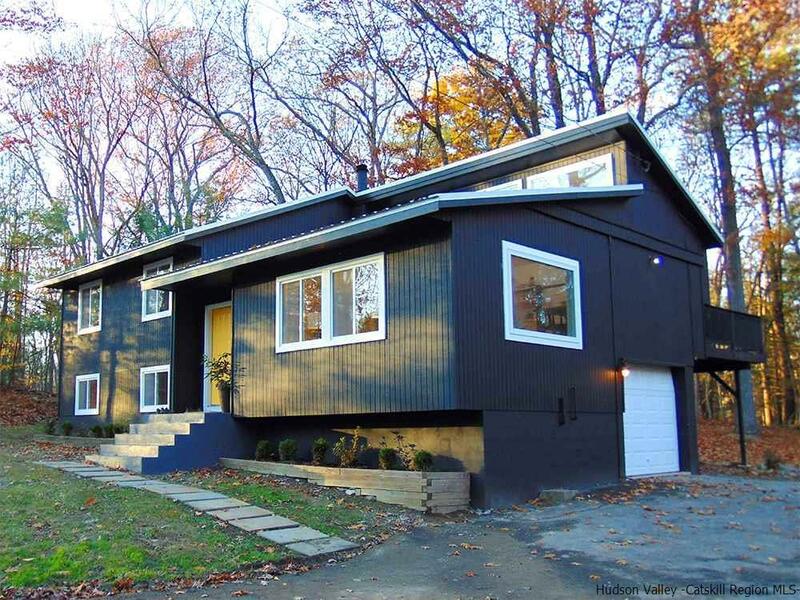 Custom designed 3 bedroom, 2 bathroom scandinavian inspired contemporary sited on 2 private acres. Set back from the road at the end of a quiet cul-de-sac, this home is located minutes from the vibrant Village of New Paltz yet offering seclusion. With clean lines and a practical design and desirable open concept, there is no stone left unturned here. This home has been meticulously transformed by a distinguished interior designer. Enter the home into the sun-drenched sprawling living space with soaring ceilings, cable rail staircase, brand new custom kitchen with Quartz counter tops and dining area, which walks out to the back deck offering total privacy and seclusion surrounded by mature trees. Three generous bedrooms and one full remodeled bathroom compliment the main level of the house. The lower level is fully finished with an office/den and family room/media room with a summer kitchen and a second fully renovated bathroom. A one-car garage walks into a finished mud-room and laundry area adding to the overall convenience of simple living in this home. All new windows, new floors, standing seam metal roof, brand new kitchen, bathrooms, flooring, and modern finishes throughout. This friendly neighborhood offers walking trails from your front door, woods for exploring, steps to the Rail Trail, minutes from downtown New Paltz and a few miles from the world renowned Shawangunk Mountains. Ideal for a weekender or a full-time resident looking for a turn-key home with nothing left to do but move in. Selling Office: Taft Street Realty, Inc.